Hi guys, today we will looking at a pair of dress shoes from homegrown shoes microbrand, Earnest & Collective. While this blog will mainly focus on reviewing watches, from time to time we will review other products essential to the dapper male – with dress shoes being one of them. The Earnest & Collective Carnegie (Tan) in its full glory. I managed to grab a pair of their Carnegie dress shoes (in Tan) during Black Friday sales, and have spent the last week wearing them almost daily – I even wore them to an army BBQ cohesion! So what are my opinions on them? Let’s find out. Earnest & Collective, founded in 2016, is a homegrown Singaporean brand that aims to “make great quality shoes affordable for the everyday man”. They pride themselves in honest pricing, and claim to be able to afford quality shoes at affordable rates by “removing middle-men and wholesale mark-ups”. Now, this claim of removing traditional markups and going straight to the consumers has been flogged to death by multiple watch brands, and more often than not it’s more marketing gimmick than actual savings (cough, MVMT, Filippo Loreti), but it’s actually the first time that I’ve seen a shoe company make that claim. 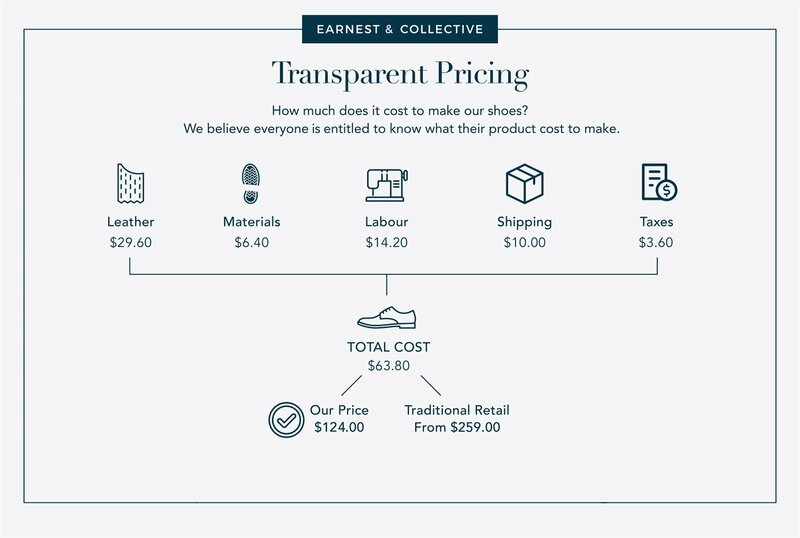 Earnest & Collective lists their cost of production on their website, so you know the exact mark-up of the shoes they make. Also, I must mention that after I had placed my initial order, Earnest & Collective actually emailed me. Apparently the shoe that they had was in a darker color than the tan reflected on their website. What impressed me was that they reached out to me in the aftermath of Black Friday sales, when they were probably swamped with orders. That showed me that they were committed to honesty and transparency – something unfortunately lacking in the market today. So we know that Earnest & Collective prides themselves on offering quality shoes at honest pricing. Their dress shoes are priced at $124 retail, which is reasonable as dress shoes goes. The question is – are their shoes of good quality? For $124, the shoes are surprisingly well made! Look at the sheen on that leather! Firstly, Earnest & Collective uses natural full-grain leather in all their shoes. For those of you who have read my previous articles, you guys would know that I’m extremely picky about my leather and settle for nothing less than full-grain leather. For those who are uninitiated about leather, I’ve talked about the different grades of leather in my maiden article here. With natural full grain leather, the suppleness is obvious, especially when compared to the standard “genuine leather” offerings. While full-grain leather feels great on the wrist (as a watch strap), they feel even better on the feet! In addition, over time the leather should develop a pleasant patina with wear. Furthermore, each shoe is made from scratch, taking roughly 38 hours to come together. The leather is cut by hand, and the shoes are hand-lasted as well (If you don’t know what a last is, go Google and educate yourself). The leather is also hand-colored, meaning that every shoe, in theory at least, will look slightly different. The fact that most of the shoe is built by hand, at this price point, blows my mind. It is by no means bespoke (We’re not talking Josh Leong or even CustomMade here), but Earnest & Collective has definitely managed to set themselves apart from the mass-produced offerings by Pedro, Aldo, etc. Secondly, I would like to highlight the quality of the stitch-work here. In lower-priced shoes (especially shoes priced below $100), one tend to see flaws in the stitching – loose threads, uneven spacing, etc. Not here. The stitching here is immaculate, and honestly, quite extraordinary for the price. On paper, the main downside would be the use of cemented construction and rubber sole. As mentioned in my previous article, cemented construction and the use of rubber sole are the lowest grade of construction available, as compared to shoes that are blake-stitched and with leather soles. However, those shoes tend to cost $300 and up, so at the Carnegie’s price point the usage of cemented construction and rubber sole isn’t that big an issue. My main issue is with the slipperiness of the sole. I thought it would break in over time, but the sole remained slippery even after a week of constant usage. Rubber soles are supposed to have more tack than their leather counterparts – in fact, that is probably the sole advantage (haha, geddit?) rubber has over leather (other than the price of course). For the sole to be made of rubber, yet still remain as slippery as a leather one, just confounds me, and to me is probably the most major critique I have of the shoe. The insole is quite comfortable though. Probably their greatest strength – the shoes look stunning. The Carnegie looks great on the feet. Honestly, this is probably the pair of shoes that I’ve worn that has drawn the most compliments. Most people seem to think that I have poor taste in shoes, but even the usual detractors have commented that they thought this pair looked great. I love the dark, oak like color – coupled with that gleaming sheen, this is one where pictures doesn’t do justice. I need to highlight the capped toe – I just think that it’s one of the most classic designs out there. For those looking for their first dress shoe, I would suggest going for a capped-toe oxford as they are easier to dress up and down. As aforementioned, the detailed stitching around the cap-toe as well as the neck of shoe just adds that extra luxury and refinement to the Carnegie. Love the looks! According to Earnest & Collective’s recommendation, the Carnegie Tan pairs well with Navy and Grey suiting, and in my experience that definitely is the case, though it can work with Black as well. Now, the burnished leather of the Pedro shoes makes it look interesting, but I’m not convinced that the leather Pedro uses are full-grain – I couldn’t find anything about the grade of the leather they use on their website, and that usually isn’t a good sign. Generally, if a product uses full-grain leather, the manufacturer would definitely highlight that to you as it is usually seen as a sign of quality. Furthermore, the stitching on the Earnest & Collective seems better also, though I must say I cannot say for sure as I’m only viewing the Pedro’s through photos. The Carnegie looks better than the Pedro’s in any case (they definitely look more expensive), making the Earnest & Collective the winner in this shoot-out. Conclusion – so the Earnest & Collective Carnegie “shiok” or not? Shiok beyond doubt. I believe that the Earnest & Collective Carnegie present great value for the price, giving you access to quality leather dress shoes at an honest, affordable pricing. For $124 (retail), you get a pair of shoes that is mostly made by hand with full grain leather and is impeccably stitched. Furthermore, they look luxurious and elegant – a timeless classic silhouette. Yes, the sole is surprisingly slippery, but honestly unless you’re planning on running in them it shouldn’t be a major problem. Overall, I believe that you’re getting a great deal of shoe at an incredibly accessible price point. As of this point of writing, Earnest & Collective has a sale where their shoes are on $15-35 off! So if you’re looking for an inexpensive set of dress shoe, go grab a pair here. P.S If you like the content, please consider a small donation! 🙂 Donate link is on the home page. P.S.S My social media handles are up! Follow the official FB page here, as well as the Instagram account here! Hi, I’m sorry to hear that. Can I suggest giving Arden Teal’s shoes a try instead, and see how they stack up?